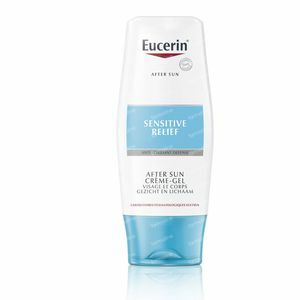 Eucerin After Sun Lotion 150 ml order online. - Hamamelis Destillate relieves the skin reddening and tightness caused by sun exposure. - Vitamin E supports skin´s own protection system against UV-induced free radicals. Perfume- and colourant-free to minimize the risk of irritations. Light, fast absorbed texture. This after sun lotion soothes sun-stressed skin and supports skin regeneration. A soothing and cooling after sun lotion for sun-stressed skin. Apply after sunbathing on cleansed skin. I have been using this for many years as I have very sensitive skin. The Eucerin after sun lotion is neutral in scent, applies really quick and doesn't give a sticky finish. Even if you're quite red burned, it still gives you a refreshing feeling and skin repair. I am allergic to some creams and lotions and I did not get a reaction from this after sun lotion. Good after sun lotion to moisturise after sun bathing and relief from burnt skin.